Let me indulge in some gentle proselytizing today, yes? I've just come home laden with plastic bags and I'm feeling chatty. Have a look at the collection of fruits and vegetables that I picked up today from my CSA drop-off point at a church here in Queens. Now. Do you know how much this whole assortment cost? Go on, guess. I'll wait. Ready? 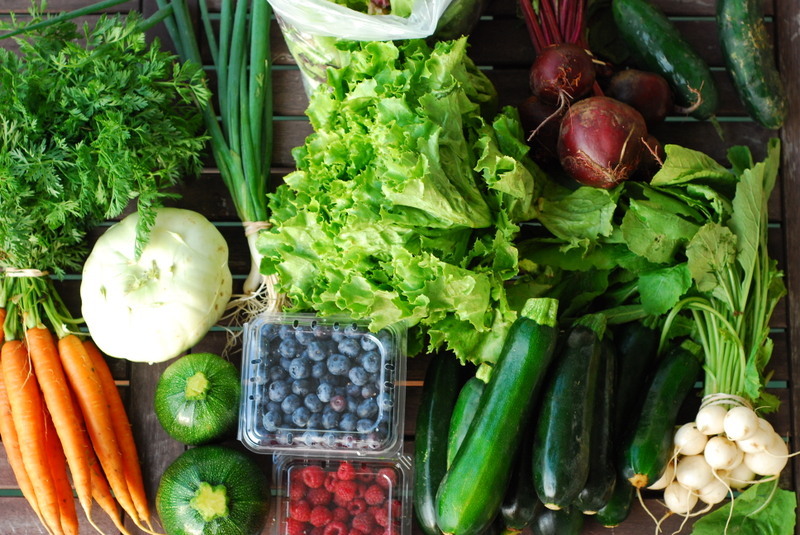 Ben and I and our friends upstairs share our CSA box, so usually we divvy everything up fair and square (they get the fruit because they pay extra), and Ben and I find ourselves with more vegetables than we can usually finish for less than $10 a week. Try and buy that same amount of food at Whole Foods or Garden of Eden or your local grocery store and you'll be spending, what, twice, three times that amount? I should do a little price comparison. Next time. CSA's are not only a way to eat fresh, local produce for more than 6 months a year and support a family farm instead of a huge, industrial farm (organic or not), but they're also very affordable, which is pretty important any day, but particularly in a time when people are finding the price of everything - gas, milk, bread, everything - going up. Plus, membership forces you to grow beyond your habits - you'll find yourself eating vegetables you'd never even known about before. Most CSA memberships are closed for the season, but if you're at all interested in joining one, early next year is a great time for signing up - sometimes early birds even get a little discount on the fee. I'm going to turn the carrots into soup, along with a fennel leftover from last week. I'll leave it chunky and serve it at room temperature. Maybe a little sour cream on top. I never do that, so it'll be a nice change. The kohrabi I'll just peel and slice into thin discs to crunch on, raw. Some people cook kohlrabi, but I simply can't - it's too good just as it is. Cold from the fridge, preferably. Who needs radishes? The berries, Gemma and Seb's, I'm going to either freeze and bag or turn into a pot of jam for them. It depends on how busy the rest of the week is. I'm going to try to eat the beets raw this time. I always cook them, but I read this week that you lose all the antioxidant power of the beets when they're cooked. So I'll shred them, maybe with a carrot or two, and dress them with a tangy vinaigrette. As for the greens, I'm a little sick of the standard garlic-and-olive-oil-saute. Any ideas, dear readers? The regular zucchini are so lovely that I'll eat a few of them sauteed with olive oil and garlic (uhh...) and the rest I'll turn into a soup, with mint and basil from the balcony. My farmer says to just eat those little white turnips raw, which sounds like fun. I never buy turnips, never eat them, not out of any antipathy, just because I'm never quite sure where to start with them. So this feels easy and good. Although I could also be convinced to pickle them. I'm in a pickling mood. I'll add the greens to whatever I end up doing with the beet greens. And the round zucchini, well, there are too few to turn into petits farcis, so I might just do a little breadcrumb stuffing - homemade breadcrumbs mixed with a large amount of minced parsley, chopped capers, some grated Parmigiano, salt, and olive oil, then mounded into the hollowed-out zucchini and roasted in the oven. What's left? Oh, right, the scallions. I'll admit, I'm stumped. I sometimes throw these into a grain salad of sorts, but I never really enjoy them, mostly because I don't like any member of the allium family raw. So, another question for you, then, do any of you cook your scallions? Tell me how.